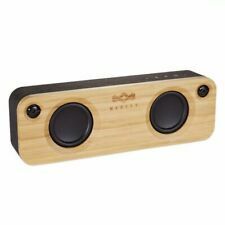 The Midnight Get Together Bluetooth Audio System from House of Marley can play back audio from both compatible Bluetooth devices as well as sources with a 1/8" audio output. Its construction features a bass reflex enclosure for accentuated bass response, a solid bamboo baffle, and rear housing covered in House of Marley's REWIND material, made of a combination of recycled plastic, organic cotton, and hemp. 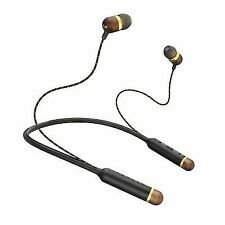 House Of Marley EM-JE041-SB Smile Jamaica Wood In-Ear Headset Earphones w/ Mic. 2 size silicone ear gels (S, M). Durable, woven, tangle-free cable. In-line microphone with 1-button remote. 2 size silicone ear gels (S, M). Durable, woven, tangle-free cable. In-line microphone with 1-button remote. Marley Headphones with bag - Gray & brown. Excellent condition and great sound. House Of Marley Smile Jamaica In Ear Headphones with Mic - EM-JE041-MID. Condition is New. Shipped with USPS First Class Package. Condition is New. Type Portable Speaker System. To Fit Speaker. Battery Life 10 Hours. Color Black. Connectivity Wireless. UPC 0846885008607. Connector(s) 3.5mm Audio Jack, USB, Micro USB. These headphones by the House of Marley are examples of excellent engineering and design. Marley features great sound and unique design such as earth friendly material. The hinges are attached with screws-no plastic pivots to snap. Speaker features Wireless Dual Speaker pairing, speakerphone carabiner clip and is constructed from recyclable aluminum. Electronics General Compatibility: Bluetooth Devices. Connectivity: Micro USB. These headphones from Marley are unique with an unusual "self-adjusting" headband design. Included with the headphones is the original cloth case. I have only the parts and pieces shown in the pic. We inspect each piece; if there are blemishes, defects or issues of any kind, they will be noted and photographed. We try to describe everything so you will know exactly what you're buying. The regal finishOne Foundation Digital Audio System fromHouse of Marley features enhanced Bluetooth and AllPlay Wi-Fi capabilities, and streams music directly from the user’s phone, tablet, local server, or cloud to create a harmonized synchronization between all speakers. 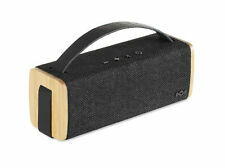 House of Marley Em-ja012-sb Riddim BT Portable Audio System Signature. Shipped with USPS Priority Mail Bluetooth® Wireless Connectivity Voice Prompt 2 x 10W 1.5” Full Range Active Drivers 2 x Passive Bass Radiator 10h Playtime Integrated Mic for Use as Speaker Phone Auxiliary Input USB Charging Cable Removable Leather Strap Pair Two Units for Stereo Sound Grab your music and join the party. The Riddim BT Bluetooth speaker comes complete with a leather carrying strap, so you can move your soundtrack with ease. With ten hours of playtime and an enhanced DSP that stacks up against the competition, it keeps you immersed in the music that moves you. No Bounds Portable Bluetooth Speaker by Marley. This is the House of Marley No Bounds, a wireless speaker. Brand new white Smile Jamaica headphones. They have a white chord with a wood finish on the outer piece of the headphones. The original box has been opened by me because I thought they were bluetooth, but they’re not. House of Marley Nesta Headphones. - NEW IN SEALED BOX. In case of problems, before leaving. productsthat are FRESH. Netherlands, New Zealand. are SEALED or have an EXPIRATION. promise to get back to you within. Open Box, Like New Condition. TRAVEL STASH BAG. BAG AND CORDS INCLUDED. NEW WITH NO BOX OR INSTRUCTIONS. Marley Jammin' Collection on-ear headphones. We hope to see you again! The speaker is in very good condition and works perfectly. 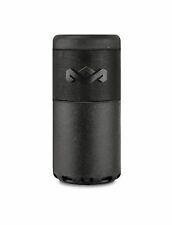 NEW Marley No Bounds Sport Bluetooth Speaker Ships Free. Condition is New. The House of Marley Freedom Stir It Up In-Ear Only Headphones With Case. Condition is Used. Shipped with USPS Priority Mail. Earth Friendly Headphones. Due to recent fraud activities. Comfortable Ear Cushions. Model: Chant Mini. Product Line: House of Marley. Connectivity Interfaces: Bluetooth 4.1 EDR. Type: Speaker. Designed for: For portable use. Manufacturer: FKA Distributing. Driver unit: 40mm. Cable length: PVC 1.3m. Audio Jack: 3.5mm stereo golden plated. Max output Power: 50 mw. Bluetooth® Wireless Connectivity. Noise isolating In-Line Microphone. Up for sale is aNEW House of Marley Smile Jamaica Wired Noise Cancelling Headphones w/ Mic (Copper). State-of-the-art features: the smile Jamaica earbuds have a 1 button remote on the wire that allows you to play, pause, and skip your music. Leather ear cushions ensure comfort during use. Recyclable aluminum, ultra soft leather and stainless steel. Take your music with you with the portable and powerful Bag of Riddim. Its unique design uses a canvas carry bag with shoulder strap for easy transportation to wherever you need great sound. An integrated iPhone and iPod dock provides simple docking and charging for your Apple device and the convenient auxiliary input lets you connect hundreds of other phones and music players. We are driven to enhance lives through great product experiences as well as using proceeds from product sales to support global reforestry through our foundation, Project Marley. Wirelessly stream music with theGet Together Mini Bluetooth Portable Audio System. Product Line: Marley Get Together. Wirelessly stream music with the Get Together Bluetooth portable audio system. The exclusive fabric cover and natural bamboo front and back panels are beautiful and sustainable. Belt strap pouch is missing one snap button. Including only what photos show. No other accessories. Em-ja012-sb Riddim BT. House of Marley. Portable Audio System Signature.